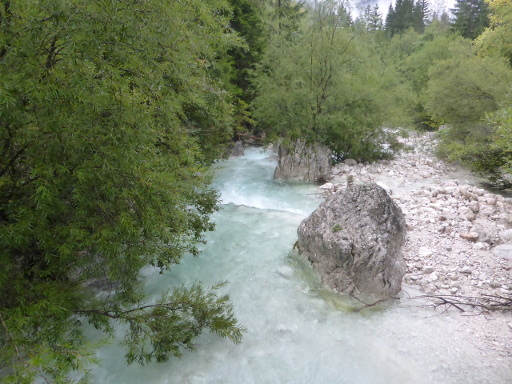 The Triglav National Park is the only national park in Slovenia. 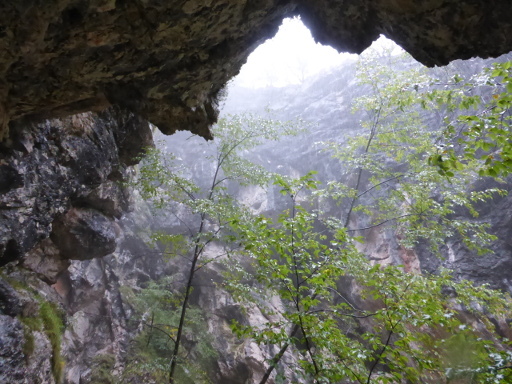 It is located in the south west of Slovenia, close to the border with Austria and Italy. This post is my preparation for a 1-day hike (1 day to get there, 1 day of hiking, 1 day to get back). I will update it after I did the hike, but please keep in mind that I might now know everything first-hand I write about. 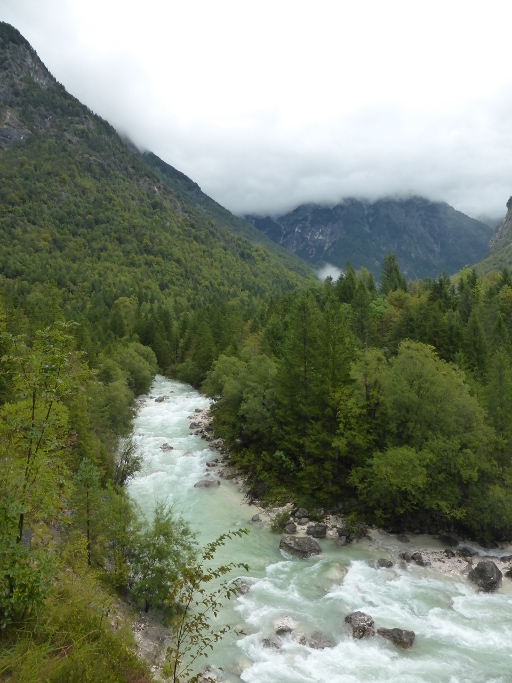 From Munich, you can get to Bovec in 4-5 hours. You can also get to the Ljubljana airport (LJU) and continue your journey to Bled or Tolmin. 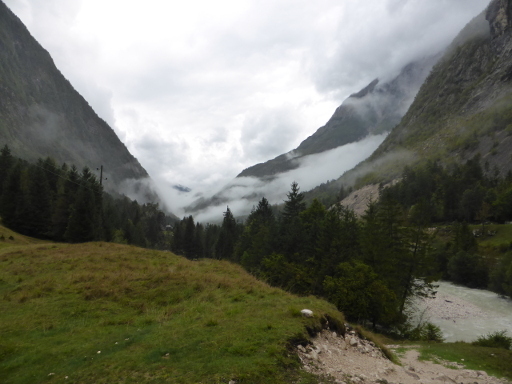 All three towns are likely a good start for getting to the Triglav National Park. I'm not sure. Probably not in winter. I guess from April to October after looking at the Climate diagram of Ljubljana's? 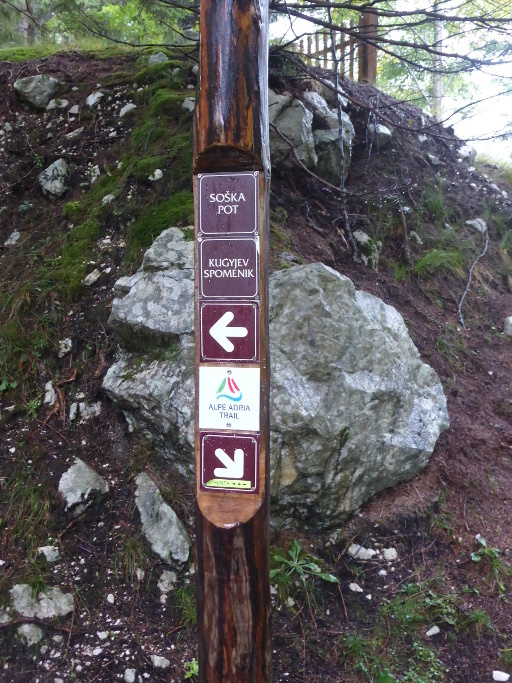 The Soča-Trail (German: Soca-Weg, Slovene: Soška Pot) is stage 24 of the Alpe Adria Trail (see map). 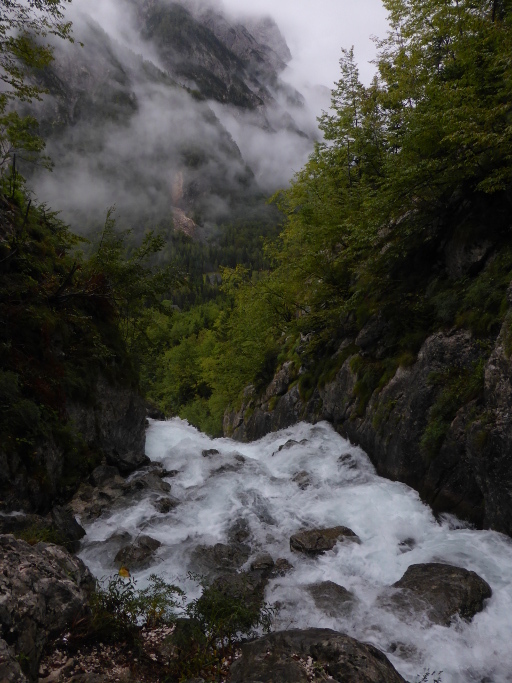 Usually people go it from Trenta to Bovec. It is about 24 km and about 6:30 h in total. 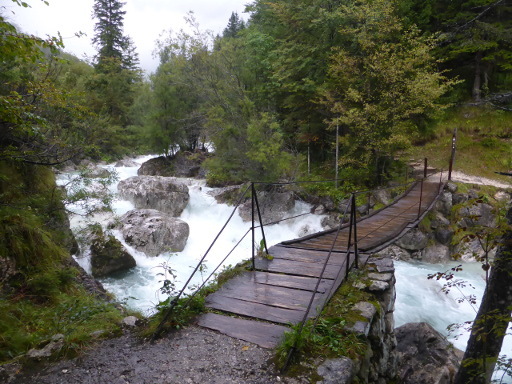 The complete trail is almost all the time next to the Soča river. 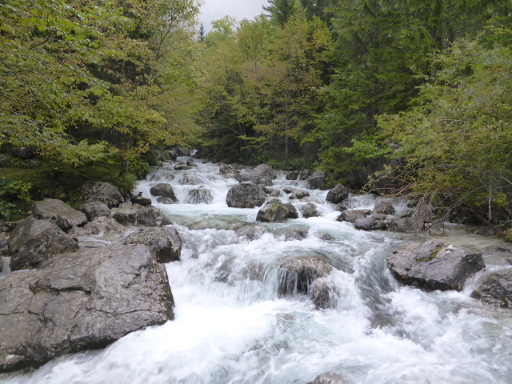 I first planned to go this in reverse, but it turns out that driving to the source form Bovec by taxi and hicking back is most practical for such a short trip. 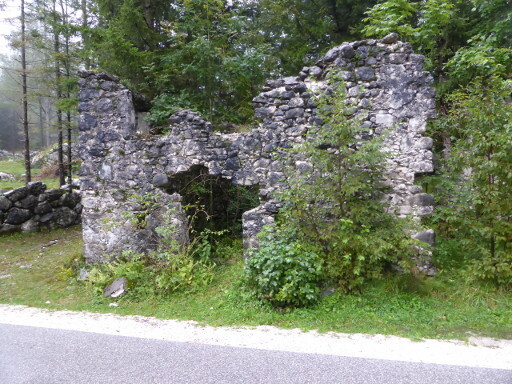 The source of the Soča river (German: Soča-Quelle, Slovene: Izvir Soče) is at 46°24'44.6"N 13°43'26.0"E. It is the starting point of this route. It is number 14 on the map. Dom Trenta (German: Trenta Nationalparkhaus & Museum) seems to be a "popular" museum. Gostilna Metoja could be a place to eat / sleep. Just stay south of the Soca. Stay south of the river and ignore the bridges at 9 and 8. Pension Kamp Klin is at 7 where you have to cross a bridge. Cross the bridge at 6, keep going north of the river for about 2km, cross the bridge at 5. 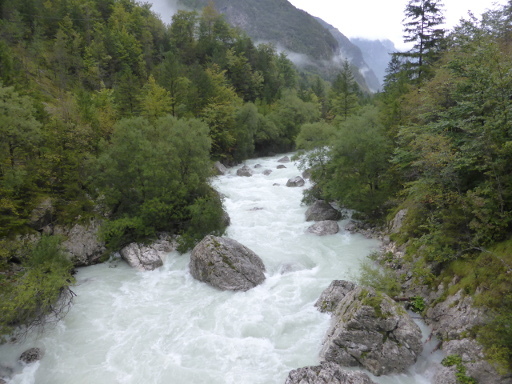 The Great Soča Gorge (German: Große Soča-Tröge, Slovene: Velika korita Soče) is between 8 and 7. Just before the Kršovec Gorge is a bridge at 46°19'59.3"N 13°35'33.6"E (Number 4). The town Kal Koritnica is nearby on the north side of the river. 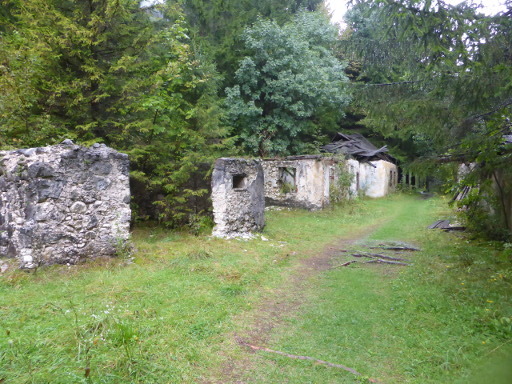 Even closer to the Kršovec Gorge (German: Kršovec-Schlucht) on the north side of the river is an old ropeway station (Slovene: Žičnica Golobar). 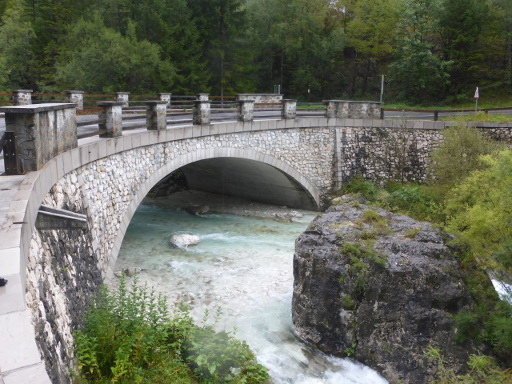 The river Koritnica (Slovene: Koritnica) empties into the river Soča (also called Isonzo) at 46°19'48.7"N 13°34'32.0"E.
The bridge at 46°19'29.6"N 13°36'15.1"E at 5 in the image. Cross it to get north of the river. The bridge at 46°19'29.6"N 13°33'12.6"E is nr 3 in the image. At 46°19'29.6"N 13°33'12.6"E is a bridge (2 in the image). Where is ...? Wo ist ...? Kje je ...? 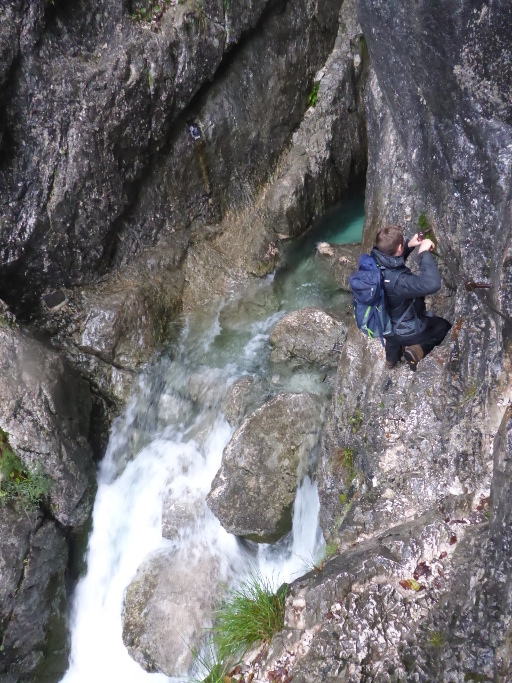 We planned to arrive at Bovec in the evening of Friday, hike on Saturday and go back on Sunday. 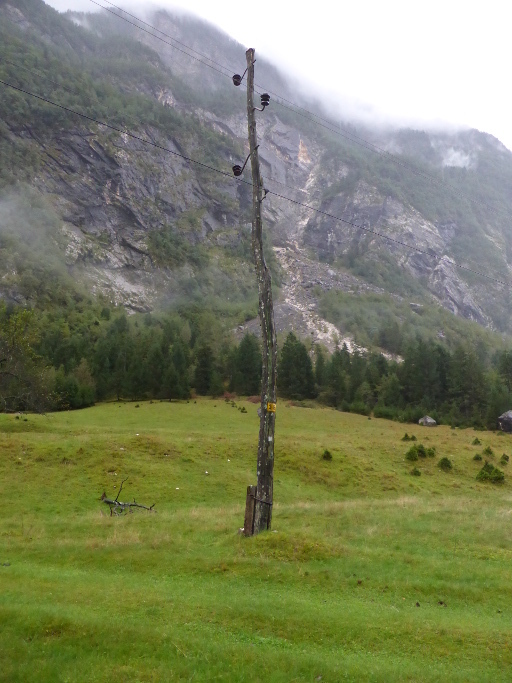 The Bovec hostel includes breakfast. Quite a bit of the following will just stay in the car. For Austria might have to buy a vignette and/or road charge. 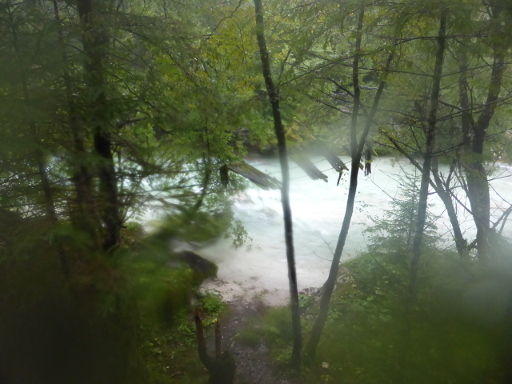 The Vintgar Gorge (Slovene: Soteska Vintgar) is 6 km from the Lake Bled. 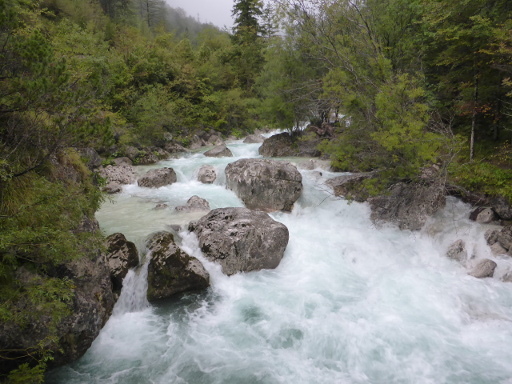 Tolminer Klammen are at the very south of the Triglav National Park. Evamaria Wecker: Slowenien. 53 Touren zwischen Julischen Alpen und Adriaküste.